We develop compelling new wine brands that our clients leverage to engage their customers and improve their bottom line. We use our decades of winemaking, grape sourcing, and brand development experience to create a turn-key private label wine solution for our clients. Our industry expertise and low minimums make it easy for your business to start its own private label wine program. Why make a private label wine? Our private label wine programs allows our clients to create value for their customers by offering higher quality wine at lower prices. Exclusivity helps our clients stand out in a crowded marketplace and build customer engagement. By reducing many of the sales and marketing costs associated with the three tier system our clients create higher than industry average gross margins on sales. This has a powerful impact on their bottom line. Creating new compelling private label brands is what we do best. We can use artwork and branding provided by the client or we can create a new custom brand from scratch. We have talented graphic designers on our team and a library of proprietary brand concepts and labels for clients can refer to when developing their label. Our in-house compliance team will assist in registering your label with the TTB and other regulatory needs. Whispering Vine is a three unit restaurant, wine bar, & wine retail group in Reno, Nevada. The owners created a unique way to give back to their community. With the help of Real Nice Winemakers, they created their own Whispering Vines branded private label Willamette Valley Pinot Noir and Pinot Gris. 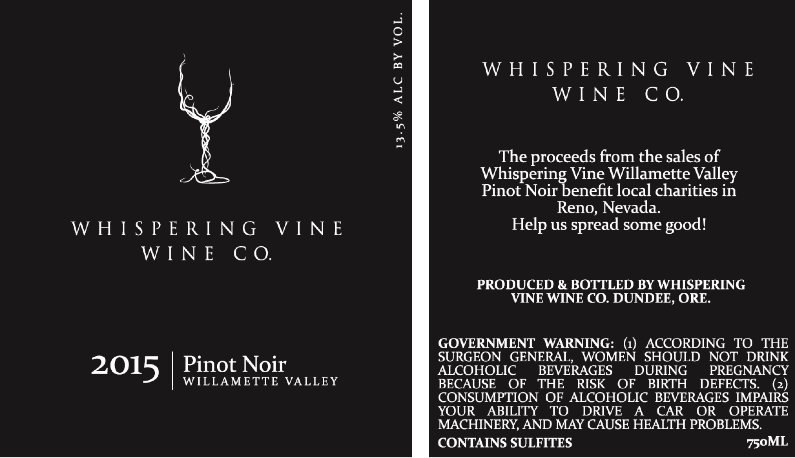 The proceeds from these wines are donated to local charities in and around Reno. We helped by sourcing high quality grapes from estate vineyards in the Willamette Valley. Our team farms for quality using best practices learned over decades growing grapes in Oregon. Our winemaking team took input from the owners to craft a style of wine within their parameters. Finally, our graphic designer took elements of their logo and developed a custom wine label that reinforces their brand. By minimizing many of the usual sales and marketing expenses associated with the three -tier system our clients successfully produced a high quality and high gross margin product. The wines were an instant hit with their customers. The first run sold out quickly and they immediately signed up to a make a second vintage, this time increasing their production to meet the demand. The owners are pleased to have successfully created a vehicle to give back to the community that supports their businesses. The program is now generating thousands of dollars annually for local charities. Filling out the form below is the best first step as it will position you to begin thinking about the specifics of your private label wine project and give our team enough information to get started! Our team will review your project and get back to you within a week to discuss next steps. No, We've Got That Covered. Minimum orders vary, and we do try to be flexible, but private label projects begin at 100 cases. COLA/ TTB label approval is required when selling in the US, thus taking a bit more time to complete. Thanks for your interest! Our team will be in touch soon.